When my husband and I were missionaries in Hungary we simply adored eating Hungarian plum tart. I found this recipe last year which uses American ingredients. I tweaked it a bit to make it healthier, reducing the sugar and using whole wheat flour. I was happy to be able to share this old favorite with my kids, and they love it, too! It’s sweet enough for a dessert, but with my healthier version, I feel perfectly justified serving it for breakfast! Heat milk to scalding. Add butter and 1 1/2 Tbsp of sugar, stirring well until dissolved. In a separate small bowl, add yeast to water, along with the other 1 1/2 Tbl. of sugar. Put 2 cups of flour in large bowl or Kitchenaid mixer and add cooled milk, yeast mixture, eggs and salt. Beat well. Add the additional flour and work until dough comes away from sides of the bowl. Dough should be very soft and sticky. (If too thick, add a few teaspoons of warm water). Cover and let rise till double in bulk. 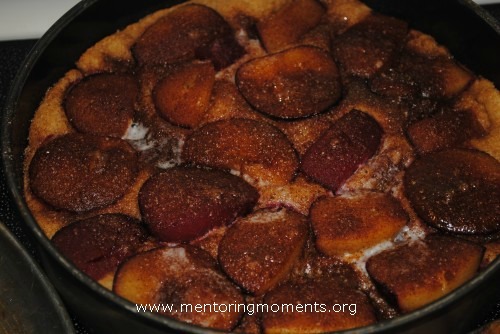 This recipe will make 3 nine inch cake pans of plum cake. That doesn’t last long in my large family, but these freeze well and make great gifts, too. When dough has risen, spray pans with nonstick spray. Put a third of the dough in each pan. I coat my hands in a bit of vegetable oil so the dough will not stick to me. Using your fingers, push the dough to the outer edges of pan. Arrange the plums halves on top of the cakes, covering each cake liberally with plums. Sprinkle each Kuchen with a third of the topping and dot with butter. *This cake also tastes great made with apricots! Mix sugar, flour and cinnamon together. The original recipe calls for 1 whole cup of sugar and 1 1/2 Tbl. cinnamon, but I feel like that is too much, especially for breakfast. I cut the sugar in half and my family has never missed it. I don’t even always use up all the topping. I just sprinkle each cake with the cinnamon sugar mixture evenly until it looks like “enough”. The original recipe also calls for more butter; I have reduced the amount called for by half. Let rise for another 1/2 hour. Bake at 350 degrees for 30 to 35 minute or until sides and bottom are golden brown. Eat a piece while it is still warm, and another the next morning at room temperature. Last week I had some plums and no recipe or idea how to use them! I’ll be trying your cake out this week. Looks yummy!